In the first BioShock, you were a normal little human, fighting Splicers and Big Daddies. In BioShock 2 you're a Big Daddy, and since fighting plain humans would pose no challenge, the game had to introduce something new. As a skilled boxer, he left London behind to make his way in Rapture. Quick to anger and bigger than most, he found that he rarely fit in with other men. When the city cracked open, he changed with it. The flooded streets tested man against man and his skills made him a first-rate ruffian - never afraid to hit below the belt. After years of hoarding ADAM he's now capable of inhuman feats of strength - hurling insults one minute, tables the next. He's also a raging homophobe who took up boxing rather than wrestling because it had less physical contact with your opponent (though under the influence of hypnosis, he admits that he got so big and fearsome because he was afraid his own homosexuality would be uncovered). The idea was that the Brute Splicer would be the same size as a Big Daddy, and at 7⅛" tall, the toy lives up to that perfectly. He's a giant, a monster, and yet paradoxically, he still looks fairly human. His face is distorted, sure, but he's nowhere near as abnormal as the other Splicers are. They're gruesome; he's merely frightening. There's a difference. The Brute Splicer is clearly outgrowing his clothes, but you can tell they were quite posh before he Hulked out. He has a white shirt with the sleeves rolled up to his elbows, though the buttons down the front are straining and ready to pop. 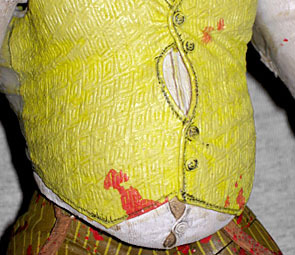 Above that is a waistcoat that's already begun to give up the fight against his stomach; it's got an intricate, sculpted pattern on the front, while the back is perfectly smooth to suggest it's made of silk (there are still wrinkles and seams, but no textile textures). Some buttons have popped off the front, and the seams are splitting in the back. The pants are pinstriped and spattered with blood, and suspenders hang from his waist. Well that's not going to help hold his trousers up! 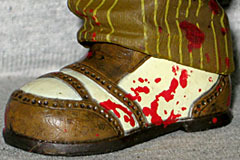 He's wearing gangster shoes, with brown and white panels (and more blood). The shoes are detailed to look like punched leather, which makes them better than smooth, featureless feet would have been. All his clothes have the right kind of sculpting to suggest whatever kind of fabric they're made of, so good work, Jason Frailey! The paint is very nice, as well. We've already mentioned the blood a few times, but it looks great. It's a mix of bright red and dark brown, suggesting both fresh and dried gore. It's mainly found on his lower body, but can be found all the way up to his shoulders. His skin is darker than you'd expect for a guy who's been living in the dark for decades, but whatever. There's still a separate blue app for the veins in his arms, and a darker app on the top of his head to suggest the area where hair once grew. 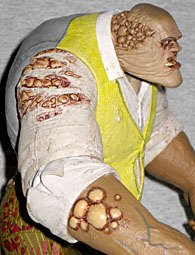 A dark wash brings out the horrible details of his face, and the large pustules on his forearms, shoulders and the side of his head are a glossy pinkish white, making them look truly horrid. The stripes on his pants are crisp, but you can definitely tell where the apps start and stop. Oh, and one stripe seems to be missing. Brute Splicer's articulation is decent, though obviously it's not going to be as extensive as the Big Daddies (or Big Sisters) were. The ankles, waist and neck are balljoints, while the shoulders and forearms are swivel/hinge joints. There are swivels at the hips, but those are just for fine-tuning the balance, not to make him look different. He doesn't come with any rubble for him to pick up and throw, sadly - his only accessory is a removable bowler hat. 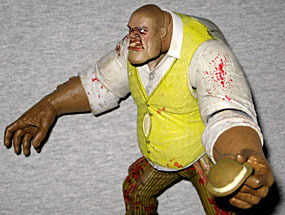 The Brute Splicer was first shown off at SDCC 2010 (and the packaging still has a 2011 copyright for the 2K Games logo), so there's no question we've been waiting quite a while for this figure. Gotta give NECA credit though, they never give up. He's a Toys Я Us exclusive, but still only retails for $15.99 - it's nice to see an exclusive that doesn't have its price inflated over the normal SRP. The figure itself is a really nice addition to the ranks of the BioShock toys. 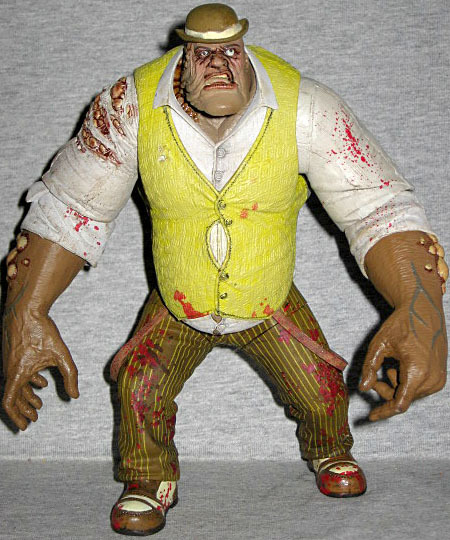 And if you're feeling industrious, this wouldn't be a bad base body for a "Joe Fixit" Hulk custom.